While the Hammersmith Flyunder project – tunnelising the A4 through central Hammersmith to improve the environment – is a popular one with locals ad businesses, the scheme is complex and difficult, and is likely to move slowly, an audience at a London Festival of Architecture event heard. 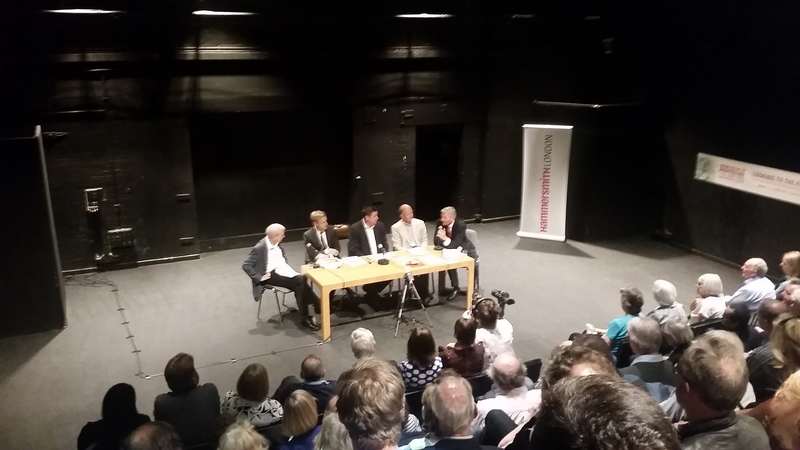 BBC broadcaster John Humphrys chaired the panel, which included Richard de Cani of Transport for London, Tom Ryland of West London Link, Martin Knights of C2HM, and Cllr Stephen Cowan, leader of Hammersmith & Fulham Council. Anyone expecting an argument would have been dissappointed. 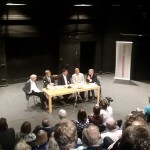 The panel were in violent agreement about the basic principles of the project and what it could deliver to Hamersmith. The audience were similarly positive. Humprhys asked for an early show of hands, which came out overwhelmingly in support of the Flyunder concept. Humphrys’ opener was that, if this is such a good idea, why has it taken so long to get going? Briefly – it’s complicated, and expensive. Tom Ryland worried about it getting too complicated, by having the unconnected but geographically linked project to redevelop the gyratory and bus station added in to the mix. De Cani said, fairly, that it’s not something TfL had done before, and that it took a lot of “nitty gritty” to work out how it could be done, although Martin Knights said there were plenty of more complicated examples around the world to copy. Cllr Cowan discussed funding – he was clear there would be no additional council tax precept. He felt that the costs would be covered by developing the land released, and with other mechanisms such as stamp duty kick backs. It was clear that the Mayor of London and TfL are suggesting that the improvements should be locally funded – with no GLA contribution. This seems harsh, given that the flyover is nearing the end of its life, and is increasingly costly to maintain. Tom Ryland made the point that most of the drivers who would use the tunnel have no connection to Hammersmith, so some GLA or Government funding would seem approriate. Cllr Cowan agreed, and said “Boris has got to put his had in his pocket”. So there were differing opinions on how the tunnel should be funded. There was also disagreement on the best tunnel length. Of the options – there are three – Ryland wants the longest version, all the way to the Hogarth Roundabout. De Cani seemed to prefer a shorter version, a hybrid of the other two – 1.7km long between Barons Court and the Town Hall. This carries a cost of £600m to £1bn, which he was clear TfL did not plan to contribute to. He pointed to the Battersea Northern Line extension, funded by a loan from Government, to be repaid by CIL, and business rate increment. Knights pointed to examples from Korea and Seattle, where the borrowing is repaid via a tax on the value and rental uplift on properties bordering on the tunelised area. There was predictable resistance to the idea of building tower blocks to fund the tunnel – the audience was dominated by long-term local residents. There was also concern over the quality of any architecture. Ryland said the council needs to appoint a design champion, and to sort out its design review panel, which was met with loud applause. What remained clear was that the principle of a tunnelled replacement for the A4 flyover has general approval from politicians, businesses, and residents. The challenge is turning that violent agreement in to action. The event was part of the London Festival of Architecture, and hosted at the Lyric Theatre, organised by HammersmithLondon BID and West London Link – a group of architects formed to look at options for improving central Hammersmith. This entry was posted in Hammersmith and Fulham. Bookmark the permalink.